Perhaps surprisingly, the question of literacy doesn’t seem to come up in the worker accident reports too frequently. It appears as though in most cases railway staff had at least a functional level of reading. Presumably their level was more than just functional, too, given the key document employees were reading, so far as the companies and Railway Inspectors were concerned, was the rule book. This was densely-written, in official, legalistic language – not an easy read by any measure. Given staff were tested on comprehension, it looks like they should have understood what they were reading, too – though of course there are many ways around this. Nevertheless, there were workers who couldn’t read. In that case, they were to have the rule book read to them, so they were still expected to know and understand its contents. Accidents to illiterate staff do appear from time to time in our database, as in this case, and in today’s post about J Kavanagh and T Cannon. Kavanagh and Cannon were employed by the Dublin and South Eastern Railway, working as ‘milesmen’: part of the permanent way gang, responsible for maintaining track. On the morning of 28 March 1914 they were working between Shankill and Bray under the supervision of ganger T Doyle, when he left them to obtain assistance. What happened next wasn’t witnessed – always a difficult situation for Inspectors like JPS Main when investigating accidents, who had to make a best guess at the probable chain of events. His supposition was that a train had approached on the line they were working on, so that had crossed it and the other line to keep well out of the way as it passed. Main concluded that ‘no sooner had it done so than they attempted to return, when a train came along the down line, and the men, failing to observe its approach, were struck by the engine and cut to pieces’ (a typically forthright statement of the time about consequences of the accident). The crew of the passing engine were unaware that they’d hit the men ‘and it was only through the bursting of the vacuum brake pipe by a keying spanner [the tool Kavanagh and Cannon had been using], and the consequent application of the brake, that the enginemen became aware of the accident.’ The line was on a curve where the accident happened, so it wasn’t unreasonable that the men didn’t see the approaching train or the crew see them. However, as Main pointed out, Kavanagh and Cannon knew the line and he ‘was assured’ they knew that the trains usually passed each other there; as a result the unstated implication was that they should have anticipated and avoided the train that hit them. Who exactly has assured Main of this detail? The report doesn’t state – but we might suspect it was a company representative, possibly seeing an easy route for the company in terms of responsibility. Main noted that the rule book was clear on this case: they should ‘have moved clear of all lines and waited until the train for which they had stepped aside had cleared a sufficient distance to enable them to see that no train was approaching on the other lines before attempting to recross the rails.’ What this doesn’t take into account was the pressure to get the work done. 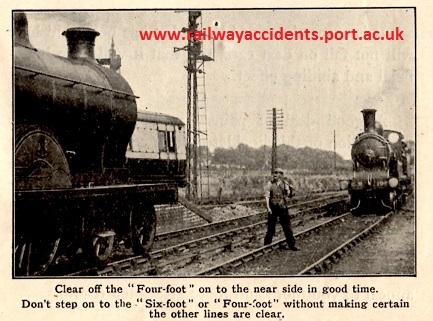 If staff were expected – required – to work in amongst moving trains, on a busy route with lots of traffic stopping and waiting until visibility was good might have taken additional time. That might bring employees into conflict with the companies, which expected a certain level of efficiency. In that situation making a decision to move back on the lines a fraction earlier becomes understandable. Main delved into the question of literacy. Of the three men named, only Cannon could read. Kavanagh had his knowledge of the rules tested just 9 days before the accident, and was found competent. Doyle’s knowledge of the rules was tested – possibly by Main, though it isn’t clear – and he was found to have a ‘fair’ knowledge. Main then went on: ‘It is a question whether a man who suffers under this disability should occupy such a position, unless the greatest care is taken to have the rules read over and explained to him at state intervals’. Damningly, Main noted that this procedure wasn’t in place on the line but that ‘it is essential that this course should be followed with men who are unable to read, a feature which, I understand, is by no means uncommon with this class of labour on this line’. The Company was directed to ‘give the matter serious attention’ (1914 Quarter 1, Appendix B). This raises all sorts of questions about expectations and class – from the obvious (and to our ears, rather patronising sounding) questions about ‘this class of labour’ to how we read the comment about illiteracy as a ‘disability’ (literally? Figuratively? Both?). If the comment about illiteracy being widespread among track workers on the Dublin and South Eastern Railway was accurate, was it confined to just this role? Was illiteracy an issue beyond just this company – possibly industry-wide? Instinct says not on that latter point, for some of the reasons already outlined, and the demonstrations of literacy we’ve seen elsewhere in our research. However, we’re only as good as the records we’ve seen! There’s an unrelated aspect to this case, about the quality of data-checking. We’d initially had J Kavanagh down as one of the cases in our database where a worker had 2 accidents. This was on the basis of a simple comparison – apparently the same name, based in Ireland, appearing on two lines. However, upon checking further details, there was no way they could be the same person: the first J Kavanagh’s accident, in 1911, was a fatality, and you can’t die twice. So, as always, a keen eye is important in analysing the data.